Author(s): Zohreh F. Kashan, Mohsen Arbabi, Mahdi Delavari, Department of Medical Parasitology and Mycology, Faculty of Medicine, Kashan University of Medical Sciences, Kashan, Iran. Hossein Hooshyar, Mohsen Taghizadeh, Zeynab Joneydy. Trichomoniasis is a sexually transmitted disease (STD) caused by a tiny parasite called Trichomonas vaginalis. Metronidazole is used as routine treatment of disease. Some reports have confirmed the potential carcinogenic and teratogenic effects of this drug on fetus and indication of drug resistance. Verbascum thapsus belongs to the family of Scorphulariaceae. Its antiinflammatory properties, disinfectant and skin healing effects are well known. This plant has been used to treat diarrhea and genitourinary infection in traditional medicine. Effects of different concentrations of the Verbascum thapsus extract were tested on the growth and motility of T.vaginalis trophozoites. To evaluate the toxicity of extract, their effects on mice macrophages were measured by MTT([3-(4,5-dimethyl thiazolyl-2)- 2,5-diphenyle tetrazolium bromide ])assay. In this experimental study the effect of Verbascum Thapsus ethanol extract on induction apoptosis in T. vaginalis was determined by Flow Cytometry. Results were analyzed by Flow Jo software and the degree of apoptosis was determined. Toxicity percentage of 25-800 μg/ml concentrations of Verbascum thapsus alcoholic extract for mice macrophages was observed between 0.17-0.25 after 12 hours and they were between 0.25-0.42 and0.45-0.95 after 24 and 48h respectively. IC50 (inhibitory concentration, 50%) of Verbascum thapsus ethanol extract and metronidazole after 24h was 39.17 and 0.0326 μg/ml respectively. 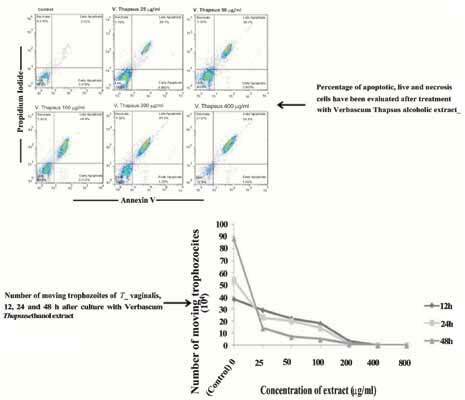 Flow cytometry results showed the percent of apoptosis following treatment of trophozoites with different concentrations of Verbascum thapsus ethanol extract (25, 50,100,200,400 μg/ml), were 20.7, 37.04, 47.5, 62.72 and 86.35 respectively, while in control group was 2.9. According to this study, Verbascum thapsus extract induces programmed death in T. vaginalis. It is recommended that Verbascum thapsus extract can be considered as a suitable choice for Medical Studies. Keywords: Apoptosis, in vitro, metronidazole, MTT, Trichomonas vaginalis, Verbascum thapsus. Affiliation:Department of Medical Parasitology and Mycology, Faculty of Medicine, Kashan University of Medical Sciences, Kashan, Iran. Keywords:Apoptosis, in vitro, metronidazole, MTT, Trichomonas vaginalis, Verbascum thapsus. Abstract:Trichomoniasis is a sexually transmitted disease (STD) caused by a tiny parasite called Trichomonas vaginalis. Metronidazole is used as routine treatment of disease. Some reports have confirmed the potential carcinogenic and teratogenic effects of this drug on fetus and indication of drug resistance. Verbascum thapsus belongs to the family of Scorphulariaceae. Its antiinflammatory properties, disinfectant and skin healing effects are well known. This plant has been used to treat diarrhea and genitourinary infection in traditional medicine. Effects of different concentrations of the Verbascum thapsus extract were tested on the growth and motility of T.vaginalis trophozoites. To evaluate the toxicity of extract, their effects on mice macrophages were measured by MTT([3-(4,5-dimethyl thiazolyl-2)- 2,5-diphenyle tetrazolium bromide ])assay. In this experimental study the effect of Verbascum Thapsus ethanol extract on induction apoptosis in T. vaginalis was determined by Flow Cytometry. Results were analyzed by Flow Jo software and the degree of apoptosis was determined. Toxicity percentage of 25-800 μg/ml concentrations of Verbascum thapsus alcoholic extract for mice macrophages was observed between 0.17-0.25 after 12 hours and they were between 0.25-0.42 and0.45-0.95 after 24 and 48h respectively. IC50 (inhibitory concentration, 50%) of Verbascum thapsus ethanol extract and metronidazole after 24h was 39.17 and 0.0326 μg/ml respectively. Flow cytometry results showed the percent of apoptosis following treatment of trophozoites with different concentrations of Verbascum thapsus ethanol extract (25, 50,100,200,400 μg/ml), were 20.7, 37.04, 47.5, 62.72 and 86.35 respectively, while in control group was 2.9. According to this study, Verbascum thapsus extract induces programmed death in T. vaginalis. It is recommended that Verbascum thapsus extract can be considered as a suitable choice for Medical Studies.